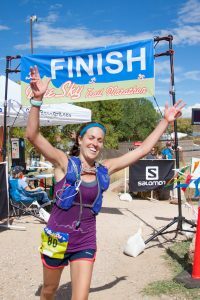 The 10th running of the Blue Sky Trail Marathon is less than a week away. Hopefully your training has been on point and you’re ready for a strong run. All information relevant to the event is available from the race website here. In addition, we’d like to bring your attention to a few key details. The weather forecast for Saturday is showing daytime highs near 60 degrees, which would be ideal; however, the forecast during the week up to Friday looks decidedly warmer with highs in the mid-70s. The Blue Sky course is very exposed over the last 18 miles and the trail can get pretty toasty, so please plan accordingly if the warmer temperatures carry over to the weekend. An optional packet pickup will be available on Friday from 4pm to 7pm at Altitude Running. We will be handing out bibs on race morning to ensure we have an accurate list of starters. Altitude Running is located at: 150 E Harmony Rd on the northeast corner of College and Harmony. Limited parking is available at the Blue Sky trailhead by the race start for carpools of two or more *runners* (55 spaces, first come, first serve) and additional parking will be at the Marina off Shoreline Drive, 3/4 of a mile from the start. If you are driving solo and parking in the Marina, please give yourself adequate time to get from your car to the start. Race day parking passes will be handed out when you arrive at the Marina or Blue Sky trailhead entrance. Runner Drop Off will be just off Shoreline Drive around the corner from the Blue Sky Trailhead. Additional details and a map of the parking setup is available on the race website here. We will have a start/finish gear drop area, if you want to avoid heading back to your car before the race starts – or think you might need or want to drop or pickup something when coming back through at mile 9.2 of the race after the Horsetooth loop. Bags should be labeled (we’ll have duct tape and sharpies at the start). There are no other drop bag locations on course. We have added a 10am cut off at the mile 9.2 Blue Sky aid station. Indian Summer South cut off times will remain the same as previous years at 12:30pm outbound (15.6 miles) and 1:45pm inbound (20.3 miles). This is a cup-less race. We ask that all runners carry a water bottle or hydration pack for refills at the aid stations. 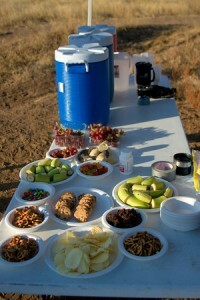 Be sure you have adequate carrying capacity so you can hydrate adequately between aid stations. The four aid stations (six total, as the two Indian Summer aid stations are visited twice) will have water, VFuel sports drink (Cool Lime or Black Cherry Cola), in addition to assorted snacks and fruit. The first Towers aid station will have water and Vfuel drink only. 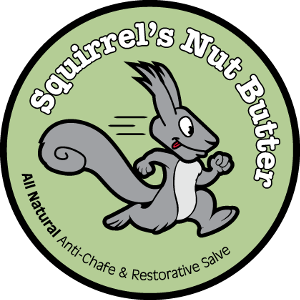 We will have VFuel bulk gel (Mountain Berry, Cool Citrus, and Vanilla) at the start of the race and at the Blue Sky aid station at mile 9.2. Bring your own flask to fill if you would like to use gel from the aid stations during the race – packets will not be available. We’ll be offering a full post-race BBQ with beef burgers and vegan burgers and soup from Boulder Organic (both gluten free and vegan options). 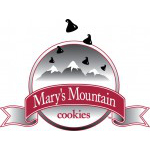 Also look for Mary’s Mountain Cookies, Great Harvest cinnamon buns, and New Belgium beer. The BBQ is free to all participants. If you did not purchase extra tickets with your registration, additional meals can be purchased at the BBQ for family and friends for a $10 donation to The Teaching Tree Early Childhood Learning Center, one of the race beneficiaries. In addition to finisher awards, we have overall and age group awards (Open: under 40, outside top three; Masters: 40-49, outside top three; Grandmasters: 50+). We have gift cards to Altitude Running for award winners, Salomon running shoes for overall winners and a smorgasbord of sponsor gear to give away in the post-awards raffle. We will also be recognizing the 2017 Gnar Slam finishers and Blue Sky Five-Year Finishers. If you have questions that are not answered here or on the website, then please email. We will do our level best to respond in a timely manner. We sincerely look forward to seeing you all on Saturday morning!